Should Doctors Play a Role in Determining Who’s Fit to Drive? When to take grandma’s keys away: In the United States, this question treated is largely treated as a family matter. But that is not the case in Canada, where the government requires doctors to report to licensing authorities when their patients start showing signs that, behind the wheel, they might pose a danger to themselves or others. A recent study from the New England Journal of Medicine has raised the question about what role physicians should have in helping determine fitness for driving. Researchers found that a group of 100,000 Ontario patients identified by doctors as potentially unfit to drive were involved in 45 percent fewer severe road crashes following the doctor’s warning — whether they stopped driving altogether, drove less, or simply drove more carefully. Licensing agencies revoked licenses between 10 and 30 percent of the time when alerted by a doctor. But even the study results highlight what a sensitive matter retiring an elderly individual’s driving privileges can be, especially in a society where, in so many residential locations, losing the ability to drive can mean a near total loss in independence. The study also found an increase in mood disorders, like depression, among those who were singled out by doctors. In addition, one in five such patients switched doctors — a fact that might help explain why U.S. doctors have not necessarily been eager to interject on this issue. He quietly began to analyze what would happen to him and his wife, who doesn’t drive, if he did. His longtime doctor wouldn’t advise one way or the other. So over a few months, the couple tried online grocery shopping. They took a taxi to the dentist, not cheap at $38 round-trip. But Benson calculated that maintaining and insuring the car was expensive, too, when he drove only 3,000 miles a year. A few weeks ago, Benson surprised his family by giving away the car, and he says he’s faring fine so far. The American Medical Association recommends a few tests for doctors to determine their patients’ fitness for driving, reports NPR. Among those is an order to walk 10 feet down the hallway, turn around, and come back. Driving problems have been correlated with patients for whom that task takes longer than nine seconds to complete. Other important questions for medical professionals are whether older drivers can turn their neck far enough to check the “blind spot” when changing lanes, or whether they have the strength to slam the brakes. Even if states or the federal government aren’t willing to require medical supervision for elderly drivers, some counseling from physicians could help families begin delicate discussions, NPR concludes. U.S. states have different policies for older drivers. Many states, like Florida and Maine, require them to take a vision test for their license renewal. Illinois requires a road test for drivers 75 and older. A few states, like Tennessee and North Carolina, however, actually make it easier for older drivers to renew their licenses. 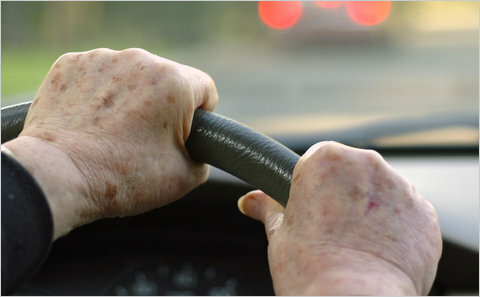 In Tennessee, drivers who are older than 65 do not have to renew their license at all. And, according to the National Institute for Highway Safety, many states have prohibitions on special requirements for drivers of advanced age. I think doctors do have a role to play. It is much easier for a doctor to convince someone they can’t safely drive than a family member. They have an independent source of authority. In January I moved in with my 98 year old Grandmother, who still had a driver’s license, in part to keep her from driving. Her doctor refused to back me up on the family concerns about her driving. It was very unhelpful. I didn’t care if she killed herself driving, I just didn’t want her killing anyone else. It would be very convenient to have a doctor involved. One stop shopping: one ~$500 visit to confirm I’m fit to drive and I can also get my medical marijuana card, handicap placard, and my dog tagged as a service animal for my nervous condition. A medical exam is required to get an airplane pilot’s or sea captain’s license. Why not to drive a car or truck, especially with risk increasing so much with age? While making sure that elderly people who might have problems driving safely is important we should never forget that teenaged drivers are even more dangerous. This is so needed. I wish this had been the case when my elderly father stopped driving. He loved driving, so when he reached his 80s and began to have memory loss issues, the family was very nervous about when the day would come when he would have to give up the keys. Then, one evening he went missing. He drove to the pharmacy and didn’t come home. Calls were made to the missing person detail of the local police. The following afternoon, we received a call from the local police in a town 40 miles from my parent’s home. They had him. He was walking in a park and fell down. Someone saw he was in distress and called 911. He had his wallet and car keys, but he couldn’t remember where the car was parked. About a week later, the car turned up parked on a nearby street, out of gas. It was found by the mother of a schoolchild where my sister taught school, who recognized the car from my sister’s description. Apparently he had driven until he ran out of gas, slept in the car and started walking for home. Except for the 18 hours of worry when he was missing, this story had a happy ending. Dad was returned, unharmed. He willingly acknowledged that his driving days were over. I shudder to think how he could have been injured or injured someone in an accident. We knew that Dad was having memory loss issues, but no one wanted to tell him to give up the keys. If a doctor had ordered it, I feel sure he would have given them up no problem. To make my snark below more explicit: I believe the medical marijuana, service animal, and handicap placard systems in many areas have shown that it’s relatively easy to get some doctor to sign off on something for a fee. I would expect there to be ads in the local paper for doctors who will sign off on your driving capability, though the potential for negative outcomes is more risky than signing off on your need for marijuana, taking your dog into restaurants, or a handicap placard. How about when a doctor signs off on a old person’s ability to drive, they share in the liability if that driver kills or injures someone. I wonder how much that would add to a doctor’s medical malpractice insurance cost? No one over 50 will be able to drive. We could easily solve this issue with much stricter across the board licensing requirements, perhaps using a national driver’s license with one set of rules instead of 50 states with 50 different sets of rules. The problem here isn’t just a subset of elderly and teenagers who can’t safely drive. Rather, I feel upwards of 75% of the population lacks the judgement, coordination, or spatial perception to safely operate a motor vehicle, regardless of their levels of training. A good percentage of the remaining 25% have medical issues which prevent them from driving safely. Tests to weed this group out, following by strict driver training for those who pass the initial tests, is what we need. We also need periodic requalification regardless of age, just as is done for airline pilots. The real problem here is the insane idea that nearly everyone should be able to drive just because we’ve chosen to model our country on the automobile. With stricter licensing land use patterns would eventually adjust to the new reality of 90% needing some other way than car to get around. Incidentally, health issues affecting the ability to drive are relevant for all ages, not just the elderly. For example, I never obtained a driver’s license. Now I wouldn’t even think of doing so because my severe carpal tunnel syndrome (which affects my ability to grip and turn a steering wheel more than it affects my ability to type long posts) would render me unable to drive more than maybe 15 or 20 minutes. Indeed, my hands sometimes go numb even while cycling but I’m still able to turn or operate the brakes. Not so in a car which requires much more hand movement. Joe R, has a point–there are a lot of folks driving on the streets and highways of the USA who really don’t belong behind the wheel of a motor vehicle. In other countries, licensing is quite a bit stricter. Many years ago I interviewed a West German consular official in San Francisco, who told me about German licensing requirements and how prospective drivers had to learn from a registered instructor, not Mom or Dad or the school teacher picking up a few extra bucks conducting driver training classes. If an instructor’s “alumni” had too many citations or collisions, he or she could be de-certified. The driving test was more like a private pilot’s exam in this country. Cars, too, were held to a stricter standard–no primer splotches, rusted out spots or unapproved accessories. Every two years, cars received a rigorous two day inspection. If tigher requirements were suggested in this country (which some people would interpret as “everybody who drives worse than I do, off the road!”), the automobile industry would be exerting subtle pressure to maintain the status quo. It’s a lot more profitable to sell cars than buses. Many Americans “would sooner die than take a bus to the hospital” and have the “I will give up my car when they pry my cold, dead hands from the steering wheel” attitude. Cars, trucks, SUVs and minivans represent “power”, and just as politicians and bureaucrats hate giving up governmental power, ordinary citizens don’t want to give up the “Go where you wanna go, Do what you wanna do” aspect of motoring. We know that the party will end some day, when the era of relatively cheap fuel fades away, but relatively few of us (especially those outside the Streetsblog realm) want to pay attention to the Jeremiahs and Cassandras predicting the day of reckoning ahead.